Bradford County chief clerk Michelle Shedden (above, center) is congratulated by CCAP president and Lancaster County Commissioner Dennis Stuckey (left) and Academy chair and Tioga County Commissioner Mark Hamilton. 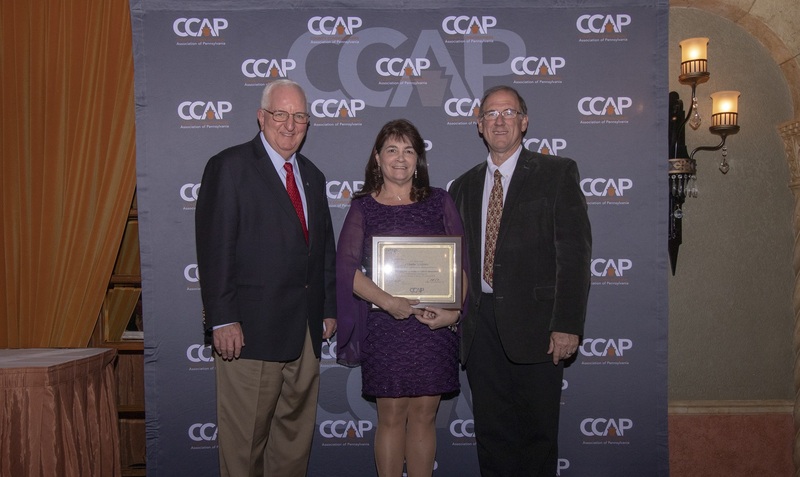 The Academy for Excellence in County Government, a certificate training program of the County Commissioners Association of Pennsylvania (CCAP), is pleased to announce that Bradford County chief clerk Michelle Shedden has graduated from the program as part of the Academy Class of 2018. The Academy program is specifically designed for county commissioners, council members, county executives, administrators and assistant administrators, chief clerks and assistant chief clerks, solicitors and assistant solicitors and their equivalents in home rule counties. Participants complete required courses in leadership, management and decision-making; county legal issues; today’s trends in county government; county functions and responsibilities; county financial management; risk management; personnel and labor relations; personal development; and, also attain elective credits by attending courses covering a wide range of relevant topics. CCAP and the Academy are committed to training informed and responsible public officials to give Pennsylvania’s counties the leadership needed to deal with the challenges of today’s county government. The Academy is a voluntary program that began in 1996. More than 150 county officials have graduated from the program and received the certificate since its inception. Twenty-two participants were honored in 2018. For more information about CCAP, log on to www.pacounties.org.